San Francisco is known for nature, museums, parks, nightlife, and shopping. Your plan includes some of its best attractions: take in the views from Golden Gate Bridge, don't miss a visit to Ferry Building Marketplace, admire the natural beauty at Japanese Tea Garden, and step off the mainland to explore Alcatraz Island. 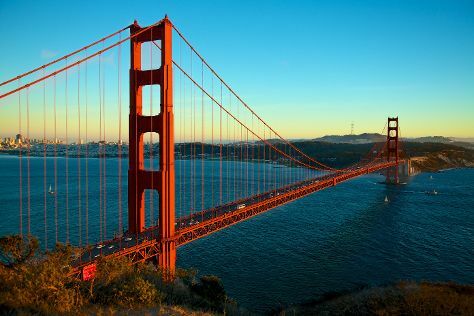 To see ratings, reviews, more things to do, and other tourist information, you can read our San Francisco trip planner . London, UK to San Francisco is an approximately 14-hour flight. You can also do a combination of flight and subway; or do a combination of flight and shuttle. You'll gain 8 hours traveling from London to San Francisco due to the time zone difference. Traveling from London in October, things will get a bit warmer in San Francisco: highs are around 26°C and lows about 15°C. Wrap up your sightseeing on the 4th (Mon) to allow time to travel to San Diego. Family-friendly places like San Diego Zoo and SeaWorld San Diego will thrill your kids. Next up on the itinerary: let little ones run wild at Balboa Park, appreciate the history behind Cabrillo National Monument, enjoy the sand and surf at La Jolla Cove, and admire the natural beauty at Botanical Building and Lily Pond. To find maps, where to stay, traveler tips, and more tourist information, use the San Diego travel planner . You can fly from San Francisco to San Diego in 3.5 hours. Alternatively, you can do a combination of subway and flight; or drive. Traveling from San Francisco in November, expect San Diego to be a bit warmer, temps between 26°C and 16°C. Finish your sightseeing early on the 8th (Fri) to allow enough time to drive to Los Angeles. Family-friendly places like Santa Monica Pier and Venice Beach and Boardwalk will thrill your kids. Next up on the itinerary: stroll the grounds of Hollywood Forever Cemetery. To see ratings, traveler tips, photos, and other tourist information, go to the Los Angeles trip planner . Traveling by car from San Diego to Los Angeles takes 2.5 hours. Alternatively, you can take a bus; or fly. Expect a daytime high around 28°C in November, and nighttime lows around 15°C. Wrap up your sightseeing on the 13th (Wed) to allow time to travel to Big Pine Key. Big Pine Key is a census-designated place and unincorporated community in Monroe County, Florida, United States, on an island of the same name in the Florida Keys. Start off your visit on the 14th (Thu): admire the majestic nature at Bahia Honda State Park, then look for all kinds of wild species at National Key Deer Refuge, and then stop by Out of the Blue Gallery. To see where to stay, traveler tips, and more tourist information, read Big Pine Key day trip planning site . You can do a combination of flight and bus from Los Angeles to Big Pine Key in 10 hours. Other options are to do a combination of flight and shuttle; or drive. The time zone difference when traveling from Los Angeles to Big Pine Key is 3 hours. Plan for a bit warmer temperatures traveling from Los Angeles in November, with highs in Big Pine Key at 32°C and lows at 26°C. Cap off your sightseeing on the 14th (Thu) early enough to go by car to Orlando. Kids will enjoy Walt Disney World Resort and Discovery Cove. Pack the 16th (Sat) with family-friendly diversions at Universal's Islands of Adventure. Have a day of magic on the 18th (Mon) at Magic Kingdom Park. The adventure continues: find something for the whole family at Universal Orlando Resort and try out the rides at Happily Ever After Fireworks. To find where to stay, maps, ratings, and other tourist information, refer to the Orlando trip planner. You can drive from Big Pine Key to Orlando in 7 hours. Other options are to take a bus; or do a combination of bus and train. Plan for little chillier nights when traveling from Big Pine Key in November since evenings lows in Orlando dip to 19°C. Finish up your sightseeing early on the 20th (Wed) so you can travel back home.